The beautiful Poinsettia well known for its red and green foliage, called the 'Flower of the Holy Night or Christmas Eve', is a traditional Christmas plant, widely used in floral decorations for the feast. 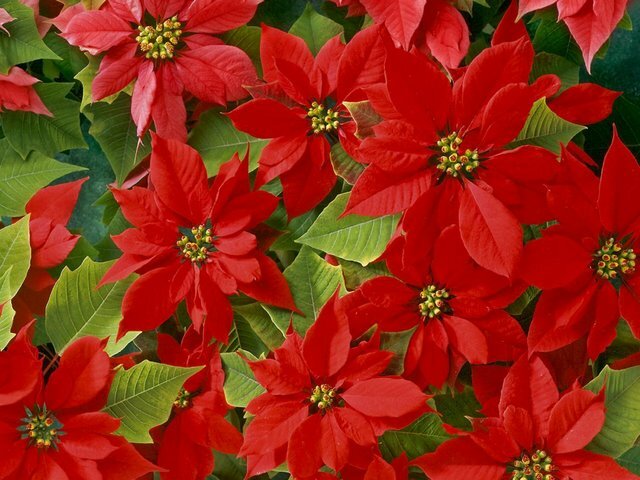 Poinsettias (Euphorbia pulcherrima) are part of Euphorbiaceae, the Spurge family. The Poinsettia received its name in the United States in honor of Joel Roberts Poinsett, a botanist, physician and the first Ambassador of United States to Mexico, who introduced it into the country in 1828. Poinsettias are not poisonous, but the sap may cause a skin reaction after touching the leaves. The sap of poinsettia may cause mild irritation or nausea for the young pets, especially puppies and kittens.